No matter what happens in basketball, the media is going to cover it with a high level of intensity. Basketball is a sport that fans want to know about and this means that there is a reason for the media to get involved with the players and teams. Every aspect of the game is up for grabs and there is a huge level of interest in the NBA Draft. With this in mind, the league organises a NBA Draft Media Day. This allows newspapers, TV shows, websites and magazines to get their quotes, headlines and stories that basketball fans want to devour. It also gives young and emerging players an early insight into the media frenzy that surrounds the NBA. This is something that players need to get used to so why not give them an early taste at the same as helping to build some hype and publicity for the big Draft? The league wants big viewing figures for the Draft so they can please their sponsors so you know that there are plenty of reasons why this media circus takes place. One of the things that some experts love to examine at these events is the attire that the top players wear to these events. Some come smart and some come very casual and the psychology experts then have a field day trying to read people’s minds. Aaron Gordon was dressed very sharply and you would be forgiven for thinking he was about to head off to a wedding after the event. At the same time, players like Doug McDermott arrived in very casual dress, letting the world know that he was very relaxed about the media attention that was being bestowed upon him and the other potential draft picks. While there are guidelines in place for players and the media to follow, you will always find some bending of the rules. Players are supposed to only talk about themselves but Nik Stauskas was more than happy to hold court on a variety of topics. 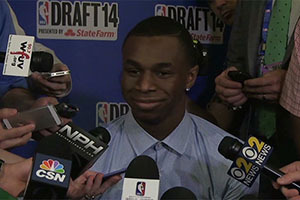 The Canadian player was happy discussing himself and his own chances but he also managed to come across as though he was representing fellow Canadian Andrew Wiggins. There is nothing wrong with talking positively about a fellow player and it seems as though Wiggins will have a huge fan in Stauskas if he makes it to the NBA. Of course, before the end of his spell in front of the media, Stauskas remembered that he has a chance of making the big time as well and he managed to point out how hard he is willing to work to make it in the NBA. Wiggins is one of the top tips for the first pick slot at the 2014 NBA Draft but he is far from being the only tip. Dante Exum is a name that is being continually talked about and he was also on good form in front of the media. Another player who was happy to speak out in front of the media was Jabari Parker. Parker suggests that he is likely be to the number 2 heading to the Milwaukee Bucks and he refuted all suggestions that he may have tanked his workout with the Cavaliers. There are murmurings that Parker would much prefer to head to Milwaukee, a team that is close to his hometown of Chicago and the thought of heading to a Cavaliers team that is in disarray may not be too appealing to Parker either.